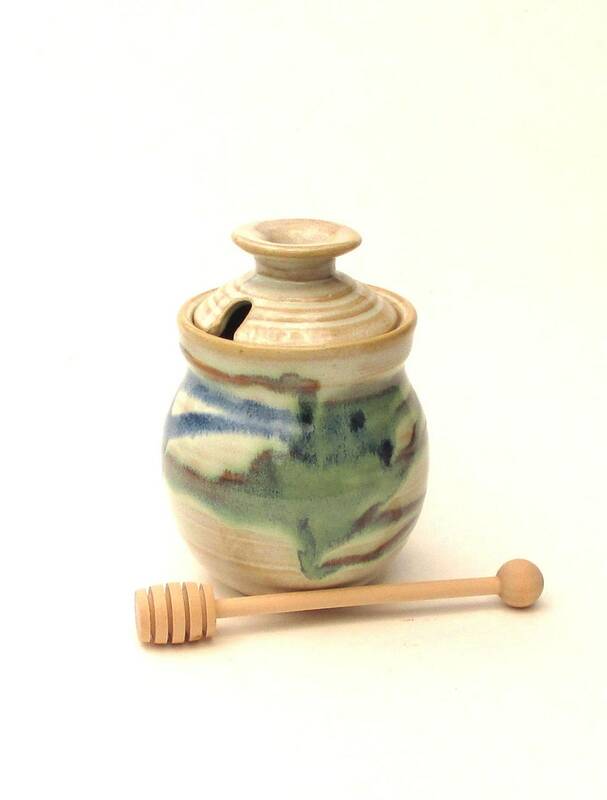 Hand-thrown stoneware honey pot by Florida potter R.L. Rising of Pensacola. The glaze color shown is called Rio Grande. Approximately 6 inches tall. All sizes are approximate because each one is hand-thrown and vary accordingly. Included in the price is a wooden honey dipper. Fired to 2350F., footed, and signed 'Rising' on the bottom. This is an exceptionally beautiful and useful piece of art. I almost hate to put honey in it, but I do. Received the item really fast with no problems. Just gorgeous! Love looking at this in my kitchen. Thank you. Even prettier in person. Arrived quickly in perfect shape. Colors and quality were as expected and my order arrived on-time.